Our coffee filter is made of food grade 304 stainless steel material, the inner filter net is made of 304 stainless steel meticulous filter net. The mesh design allows for coffee to flow through quickly and easily without any coffee grinds being released into your cup. It's safe and sanitary and easy to clean. The reusable filter eliminates paper waste, saves time and money. It is very easy to use and clean, perfect for using in your home or office, and it is lightweight and has a compact size, so it is also great for using in your traveling or camping. Using our filter, you could enjoy the process of making a cup of coffee by yourself. So what are you waiting for? Come on and choose our coffee filter! 1. 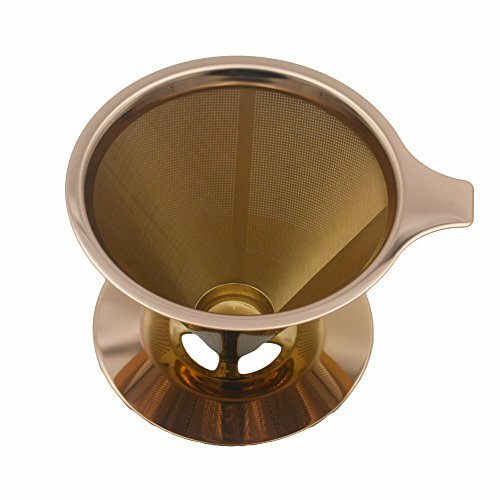 Excellent quality coffee dripper: Our double-layer pour over coffee filter is made of food grade stainless steel 304 material, safe, healthy, environmental-friendly, sturdy and durable to use. 2. Design and humanized: Mesh design allows coffee to filter quickly and smoothly, the coffee powder will not filter into your coffee mug, and you could enjoy the process of how to make a cup of coffee by yourself. 3. Environmental protection: Washable and reusable, it is very easy to clean, and help you saving much efforts and money, really practical and affordable. 4. Easy to use: Firstly adding coffee grounds in the filter, slowly pouring in hot water, letting the coffee maker drip out the water through the fine pour over filter, then removing the coffee dripper when finished, and ready to enjoy your fresh coffee. 5. Use range: It can be perfectly used in home or office, and it is lightweight and has a compact size for easy carrying, so it is also great for using at traveling or camping. If you have any questions about this product by YUESHICO, contact us by completing and submitting the form below. If you are looking for a specif part number, please include it with your message.